This family history relates that the Woolfolk Immigrant Ancestor to Colonial Virginia came from Yorkshire, England; and it provides a brief history of the Tidewater Colonies of Maryland and Virginia. Further, it identifies the counties in which the early Woolfolk families lived in Colonial Virginia and the routes they used to migrate to the South and to the West prior to and after the Revolutionary War. Each of the narrative chapters pertaining to the genealogy of the family contained in Volume I is supported by documentary information obtained from official public records found in either a narrative chapter or in one of the documentary appendixes found in Volumes I and II. The supporting documentation consists of extracts of Wills and other official Federal, State, and County records, such as military service and pension file abstracts, deeds, miscellaneous court papers, and marriage records. The reader can rest assured that the supporting data has been properly referenced with regard to the records depositories where they can be found and that all records have been accurately transcribed. Included in Volume I is a comprehensive, all-name index for the seven narrative chapters. 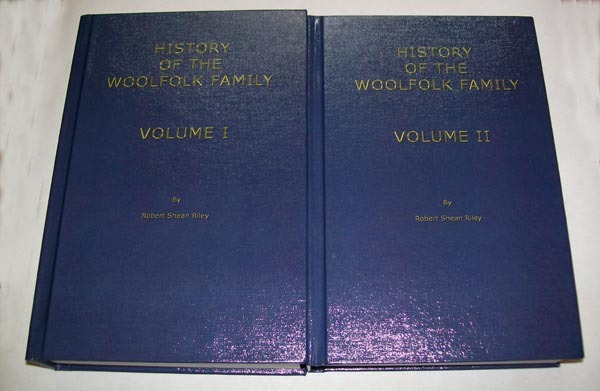 Additionally, Volume I contains a set of family lineage charts for each of the three branches of the Woolfolk family. These charts can be used to trace quickly one's line of descent from the Immigrant Ancestor, Richard Woolfolk [I], down through the generations. Volume II contains complete extracts of the Federal Censuses for all White Woolfolks in the United States from 1790 through 1900 and four appendixes which list all known direct and collateral Descendants to more recent generations to include many who are living today. Writing and compiling the History of the Woolfolk Family has been a long and tedious process, culminating in its off and on research and preparation over a period of twenty-five years or more. Along the way, the writer has experienced many unexpected delays in addition to the priority, which he assigned for its completion. Over the last twelve or more years, the writer has written and published several large histories about some notable pioneer families who settled in Central Kentucky in the late 1700s and early 1800s. And, he has still in mind several family histories yet to be written and published, provided his age and health will permit him to complete them. But, unfortunately, in the order of books to publish, the History of the Woolfolk Family fell into a lower priority. Sadly, over the interim years, many older Woolfolks and collateral descendants, who had great interest in the Woolfolk family history and with whom he had corresponded, have died. The writer has only deep regret that he was unable to complete this book during their lifetimes. Also, the reader will find the family history presented in this book to be somewhat different in some respects with similar contemporary and past publications. Straight away, the reader should note that approximately 1,200 pages of these two volumes consist of abstracts of official records and information obtained from secondary sources, family group charts, and lists of known direct and collateral descendants of the three Woolfolk family branches. In compiling this family history, the writer has striven for perfection in accuracy and completeness, as much as it is humanly possible within the limits of knowledge available to him, recognizing that the final product may fall short of that goal. He attributes his desire and efforts for accuracy and attention to detail to two lessons learned in life. Firstly, having served a career in the United States Army and much of that time as an officer on higher level staffs, he has been trained to get the facts, to study and analyze all possible courses of action, and to select the one which provides the best solution of the problem. Secondly, he has reviewed and read a lot of published genealogical material over the years, and he has been disappointed to discover that many family researchers and compilers of old county court records have taken considerable time and effort to publish incomplete data. For example, in their published and unpublished works, many inexperienced records researchers have failed to provide essential details, such as citing the exact references from which they obtained their data. As a consequence, more careful researchers have had to plow the same ground again to verify their accuracy and authenticity. The primary aim of this family history is to clarify the lines of descent and to identify and discuss briefly each member of the first five generations of the Woolfolk family. Therefore, for the reader who expects an interesting, flowing narrative of an award winning novel, the writer wishes to state at the outset that his secondary aim in writing this family history has been to provide a readable story based on original source documents taken from public records wherever possible to support his conclusions and not to rely too heavily on secondary source material or unverifiable family information. However, in those cases in which the true facts have not survived in the form of recorded public documents, he has striven to analyze the problems of descent and to reach conclusions based on sound logic which he hopes will withstand the test of close scrutiny and doubt. Further, he has striven to provide proper references and to document his findings so that the reader will be spared the agony of having to conduct additional research on their own to verify the authenticity of his sources. Whilst a small boy and as a teenager growing up in Hardin County, Kentucky, the writer had the good fortune of having his maternal grandmother relate to him stories of his ancestors and from where they came. Consequently, upon entering adulthood, he knew the names of many of his maternal ancestors and could trace them back to the early 1800s without much difficulty. Beyond 1800, however, not much about them was known, but the challenge always remained to learn more. In commencing the research of the Woolfolk family, the writer soon learned there were numerous Woolfolks in Kentucky in the early 1800s. A thorough search of the early Federal Census Records of Kentucky revealed many Woolfolks in many counties, and the task to identify and verify their correct family relationships appeared nearly impossible. In reviewing the early censuses of Virginia, the writer again found many Woolfolks living in that state in the early 1800s. Expanding the research to Virginia and pursuing what appeared to be a formidable, never ending task, the writer continued his research for more than two decades and collected a considerable amount of information on the Woolfolk families of that state. Additionally, the writer has personally searched the various genealogical libraries and archives for old court records or has hired professional researchers to conduct such searches. Regarding the contents and structure of the book, the reader will find that it contains a brief history of the English and Welsh peoples from ancient times and how they made their country of modern Great Britain; the origins and categories from which their surnames derive; the brief histories of the Chesapeake Bay Colonies, i.e., Maryland and Virginia; the origins of the Woolfolk Immigrant Ancestor in Yorkshire, England; and the routes people took from those colonies to the South and to the West prior to and after the Revolutionary War. Each of the narrative chapters pertaining to the genealogy of the family contained in Volume I is supported by documentary information obtained from extracts of public records found in the pertinent chapter or the documentary appendixes found in Volumes I and II. The supporting documentation consists of extracts of Wills and other official Federal, state, and county records, such as military service and pension file abstracts, deeds, court suits, marriage records, and Federal and State Censuses. The reader can rest assured that the writer has made every attempt to reference the supporting data properly with regard to the records depositories where they can be found and that they have been accurately transcribed. Additionally, the reader will find a set of family lineage charts which have been prepared on each of the three Woolfolk family branches and which contain essential references to the supporting documentation. These charts can be used to quickly trace one’s line of descent from the Immigrant Ancestor, Richard Woolfolk [I], down through the generations. And, finally, Appendixes S, T, U, and V in Volume II contain a list of all known direct and collateral descendants of each of the family branches to more recent generations. Although the lists of descendants in these appendixes appear to be quite large, many descendants are still unknown, despite the best efforts of Woolfolk family researchers to find and identify them.